So it’s time again to take a break from subscription boxes and catch up with my Popsugar Book Challenge. I’ve been plugging away at my reading scavenger list and I’m long overdue for another book review. Awhile back I reviewed the awesome YA book subscription box, OwlCrate which included was the fantasy book “A Darker Shade of Magic” by V.E. Schwab. I opted to use this book to fill my slot for “a book with magic” (I know, you totally couldn’t see that one coming). This was a new author for me and I was intrigued by the Dickensian setting that felt simultaneously familiar and completely foreign. 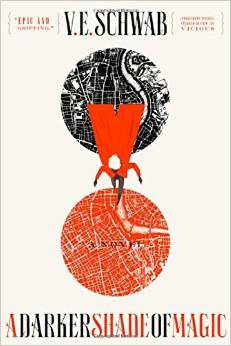 The book begins with Kell, one of the last of the travelers, a magician who uses his own blood to travel through the different Londons. Yes, Londons with an “s”. There are 4 different Londons: Grey London, dirty, boring and without magic, Red London, a place where magic and life are revered (and where Kell was raised), White London, where people fight to control magic and the battle drains the life from the city and the lost, Black London that was cut off from all the others and is never spoken of. You follow Kell’s adventures as he travels between the Londons and meets up with the crafty Delilah “Lila” Bard, a thief who dreams of far away adventures. This book is beautifully written and starts off a bit slow, but picks up speed once we are introduced to the compelling Lila. I found her easier to relate to and more intriguing than Kell, but this is the first book in a series so the hero of the story still has a long way to go. Unfortunately, we don’t get to visit Black London (which I spent the whole book dying to see), but I guess that’s a story for later in the series. Overall, I really enjoyed this book. It was a mix of Dickens and Harry Potter, and it worked well for the storyline. The one thing that detracted from the story was that the pacing felt a bit uneven, however that’s often the case in books that start a series. They have to set up an entire world and introduce characters that will last for possibly thousands of pages but still have a compelling story. It’s a heavy burden for a book and V.E. Schwab handles it well. In Fantasy, the world is another character. Fantasy stories, more so than any other genre, demand that the world and setting carry as much weight as the characters in the story. People want to visit these exotic and foreign destinations with all of their senses and it’s important to put in enough detail that they can touch, taste, see and hear the world. For another great book with magic and a young hero, try John Connelly’s “The Book of Lost Things”. Do you like books with magic? If so, what are your faves?